Wireless Monitored Security Systems – In the past, installing security systems required running and drilling wires through the walls. Nowadays, thanks to the wireless security systems, wires are no longer needed because sensors are used. They can be attached on the windows, doors and walls without any wires or screws. Smartphone Access – With the new monitored security systems, you don’t have to be at your home or business office in order to monitor what is happening. 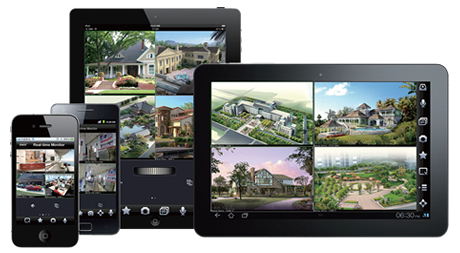 The new smart technology enables you to access your security system (including cameras) from your smartphone or tablet. All you need is a stable internet connection in order to arm or disarm your security system and to access any cameras installed in your security system. Touch Screen Keypads – The monitored security systems are equipped with touch screen keypads, which offer more features than the previous models. Monitored Security System Automation – With the latest security systems, you can check and perform a variety of functions (no matter where you are at the moment) from a computer, tablet or smartphone. Moreover, this system sends automatic alerts. For example, when traveling, you can set your system to send you automatic alarms in a case of emergency. Energy Management – Nowadays, the security systems allow owners to manage the temperature and lighting in their homes or business places. This is a great feature when it comes to cost management. These new systems come with new technologies that provide better protection for your home or business office. What is important for you is to choose a reliable and reputable supplier that can provide you the best value for your money. This means installation of the latest monitored security systems which will ensure you better home protection. Having your home or business secured with the latest monitored security systems will keep you one step ahead from the criminals who are always trying to take advantage when you are not at home.